In an effort to widen its range of healthcare and beauty services and solutions, The Farm at San Benito has launched a brand new Aesthetic Center in partnership with the renowned European Wellness and CIGNA healthcare, through Living Life Well Medical Group. The Aesthetic Center was formally opened on March 16th and offers clients the latest technology and state of the art treatments in skin rejuvenation, acne management, wrinkle reduction, scalp treatment & hair restoration, facial & body contouring, non-invasive beauty enhancements, and dental aesthetics. The Center’s new Aesthetics Program has been curated under the expert care of Dr. Conrada “Radi” Veruasa-Apostol, a reconstructive and plastic surgeon whose passion is focused on aesthetic enhancements that have a holistic touch. A practicing surgeon since 1988, Dr. Radi is known to offer procedures based on each patient’s specific needs, always ensuring minimal pain, risk and cost, with surgical enhancement as the last option. Dr. Radi is a member of the American Academy of Cosmetic Surgery, American Academy of Aesthetic Medicine, Asian Pacific Academy of Cosmetic Surgery and a fellow of International College of Surgeons. 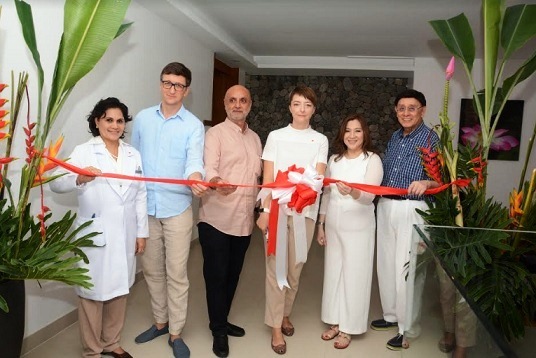 Along with surgical enhancements, beauty and skin care too, are vital elements of this new Aesthetics Program, and the resort is proud to have partnered with none other than the well-known entrepreneur and beauty buff Rosemarie “Ross” Licup. The Farm now offers guests Licup’s exclusive ‘Exuviance by Ross’, a line of anti-ageing machines and products developed by leading international companies and renowned scientists. A ribbon-cutting ceremony led by The Farm’s General Manager Preet Singh, Dr. Conrada Veruasa-Apostol, Rosemarie “Ross” Licup, Embassy of Poland chargé d’affaires Joanna Wasiewska, Embassy of Hungary deputy chief of mission David Ambrus, and society columnist Johnny Litton formally signaled the opening of the Aesthetic Center. The Farm journey is focused around five pillars, namely Diagnose, Cleanse, Nourish, Repair and Sustain. The goal is to help each guest’s body to return to its ideal, balanced state and achieve holistic optimum wellness using five key healing components: Holistic Integrative Medical Services; Nurturing Spa and Hydrotherapy Water Wellness; Plant-based, Wholefood, Vegan Cuisine; Mindful Movement and Functional Fitness; and Healing Environment and Heartfelt Service. The Farm strongly supports and highly recommends whole-food and plant-based eating with the belief that the body will thrive through daily sustenance from nature, and as such, is an essential part of the healing process and The Farm experience. The resort’s Alive! Restaurant – one of Asia’s first and finest restaurants offering vegan cuisine – serves fresh, delicious, and innovative raw dishes made with fiber-rich and nutritious organic ingredients that are rich in antioxidants, phytonutrients, probiotics and key enzymes which aid in digestion and improve nutrition. The Farm at San Benito offers a variety of world-class medically supervised Health Optimization Programs from Holistic Wellness, Detox Cleanse, Weight Management, Diabetes Prevention & Heart Health; Executive Health Programs from Pain Management & Mental Health; and Cellular Health Programs. A 4-night all-inclusive life changing holidays starts at USD 1,810++ on double occupancy. Room-only options also available starting at USD 140++ in a Sulu Terrace and USD 480++ in a luxury Narra Pool Villa per night good for two persons. Enjoy as much as 50% off on Aesthetic Beauty and Anti-ageing treatments valid until May 31, 2019. To book a retreat or learn more about The Farm, simply visitwww.thefarmatsanbenito.com. For direct inquiries, call (+632) 884-8074, mobile/whatsapp (+63) 918 884-8080, or emailinfo@thefarm.com.ph orreservations@thefarm.com.ph.